Since 2005, Dr. Beverly Everett has served as Music Director for the Bemidji Symphony Orchestra. 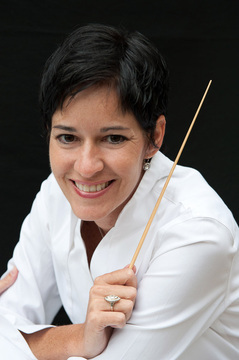 Named by the League of American Orchestras as “Clearly one of the most promising in her field,” Everett was one of six conductors in the nation to receive the 2010 “Excellence in Music Education” award by the American Prize. In 2009 Dr. Everett was the youngest-ever recipient of the “Friend of the Arts” award in Bemidji, and in 2011 she was awarded a Region 2 Arts/McKnight Career Advancement Fellowship that she used to study with JoAnne Falletta, Music Director of the Buffalo Philharmonic and Virginia Symphony Orchestra. Dr. Everett is also Music Director for the Bismarck-Mandan Symphony Orchestra. Everett champions living composers. In 2009 she conducted the premiere of “Sacred Vows,” a commissioned work by composer Libby Larsen that celebrated the 70th Anniversary of the Bemidji Symphony Orchestra. Larsen said of Everett, “I can tell you without hesitation that Dr. Everett is an ideal Music Director. She is deeply gifted as a conductor, she is deeply committed to music as the articulate language of the soul and she is completely dedicated to the place of the Symphony Orchestra in our 21st Century World.” In October of 2011 Everett premiered Chris Brubeck’s “Roosevelt In Cowboy Land,” a symphonic portrait commissioned by the Bismarck-Mandan Symphony and featuring Roosevelt scholar Clay Jenkinson as narrator. Dr. Everett has collaborated with soloists such as Carol Wincenc, Chris Brubeck, Petar Jankovic, and pianist André Watts, with whom she performed Rachmaninoff’s Second Piano Concerto with the Bemidji Symphony Orchestra in 2008. Dr. Everett remains an active concert organist and was featured soloist with the Missouri Valley Chamber Orchestra in November 2009 and November 2010. She was invited to speak on Women's Leadership in the Performing Arts at Cottey College's Institute for Women's Leadership and Social Responsibility, and received a subsequent nomination to the National Advisory Committee for the Institute. Everett holds degrees from Baylor University, where she was a Presser Foundation Scholar, and the University of Iowa, where she earned a Doctorate of Musical Arts. She studied at the Aspen Music Festival and held an apprenticeship with the Des Moines Symphony. Her principal conducting teachers include Stephen Heyde, Murry Sidlin and William LaRue Jones. She studied organ with Joyce Jones and Delbert Disselhorst. Dr. Everett is represented by Joanne Rile of Rile Arts Management. She maintains her own website at www.beverlyeverett.org. Tanya Hasbargen serves part-time as the BSO’s executive director. With vast experience in banking, healthcare, and non-profits, Hasbargen has exhibited strong leadership and skill in the areas of finance, operations, management, marketing and communications, and a passion for non-profit excellence. She has worked with four different bank systems, two healthcare systems, and is most known for the five years she served as the Executive Director of the United Way of Bemidji Area. The Bemidji Symphony Orchestra is thrilled to have Hasbargen join the organization and looks forward to continued growth and outreach. Gretchen Rusch is the Librarian and Music Personnel Manager for the Bemidji Symphony Orchestra and coordinates the auditioning and recruitment of new musicians. Rusch attended the University of Northern Iowa where she earned a Master of Library Science degree and played in the double reed studio. By day, she is a Media Specialist for the Bemidji Public Schools. Contact Gretchen to get information about auditioning.